We live in a world teeming with stakeholders. At some point in time every citizen, whether they know it or not, will be a stakeholder for something. You the reader are a stakeholder. And so am I. Now occasionally stakeholders get so fired up they become protesters. But are stakeholders and protesters actually the same thing? Illustration of a demonstration where demonstrators are waving flags & saying their demands out loud. We live in a world teeming with stakeholders. At some point in time every citizen, whether they know it or not, will be a stakeholder for something. You the reader are a stakeholder. And so am I. Now occasionally stakeholders get so fired up they become protesters. 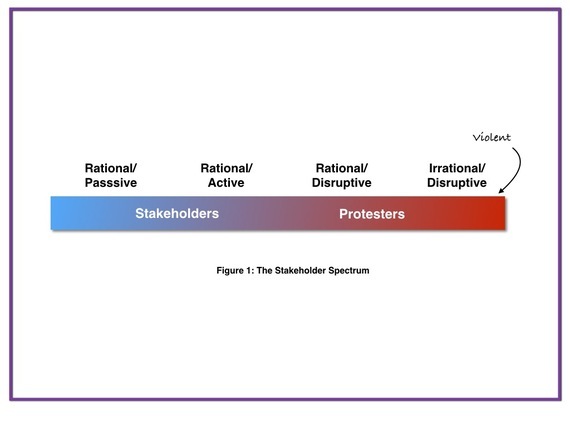 But are stakeholders and protesters actually the same thing? If not, how do they differ? a stakeholder is any group or individual who can affect or is affected by the achievement of the organization's objectives. The criteria for eligibility are quite open: "...any group or individual who can affect or is affected by..." In fact, eligibility is so open that you may not even be aware you are a stakeholder until someone tells you you are. And "affected" can mean a myriad of things, from physically affected (i.e., the proposed road is going through my front yard) to morally affected (i.e., I am morally against the building of new roads, even if they are not near my property, therefore I am affected). Somebody is trying to do something "...the achievement of the organization's objectives." Organizations can include small and large businesses, governments, not for profits, a church group, even your local little league baseball association. In other words, you don't have to be a large corporation to have stakeholders. So long as you are an organization trying to achieve an objective. Much has been written about different types of stakeholders: primary, secondary, internal, external, key, legal, individual, community interest... the list goes on. The labels are helpful only insofar as they may help organizations develop different strategies for different types of stakeholders, but they don't tell us much else about the stakeholder themselves. So I am going to propose that there is a spectrum of stakeholders. Rational/Passive. Based on my experience, most stakeholders are rational and relatively passive. They are reasonable law abiding citizens with busy lives who go to occasional community association meetings, open houses, and school meetings because they are interested and care about their community. As long as their way of life is not disrupted too much, they will roll with the changes and will passively support the organization's objective. Rational/Active. These are the community and NGO leaders who often represent a constituency. They are quite often intelligent, articulate, have done their homework, and are willing to debate the merits of the organization's objectives using factual information and survey results. For them the organization's objectives may create an opportunity for them and their constituents to negotiate a beneficial deal, so they often look for win-win solutions. Rational/Disruptive. These are the "rational/active" stakeholders whose patience have run out and see no other way to reach a deal than to be disruptive (but not violent). They will hold up a project until an agreement or resolution is arrived at, and are often willing to compromise if the organization makes a acceptable offer. Labour strikes is an example of this type of stakeholder action. Irrational/Disruptive. These are individuals or virtual organizations driven by an almost fanatic adherence to a principle, belief, or set of values. They may see them selves as on a mission. Their view may have had some factual basis once upon a time, but currently their perspective is expressed mainly with raw emotion. To be clear, the majority of these people are not violent, but they can be very disruptive. They chain themselves to trees, go on hunger strikes, hijack meetings etc. There can sometimes be violent protesters within this lot, but they are typically not welcome even by the other protesters. So there you have it: the Stakeholder Spectrum. At one end are the rational/passives, and at the other the irrational/disruptives, with a large number in between. 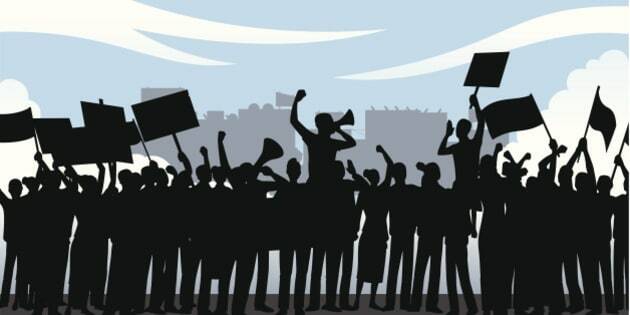 What all stakeholders and protesters have in common is that they can affect, or are affected by, an organization's objectives. So, by definition, every protester is a stakeholder, but not every stakeholder is a protester. Where they differ is how they choose to respond to the situation.